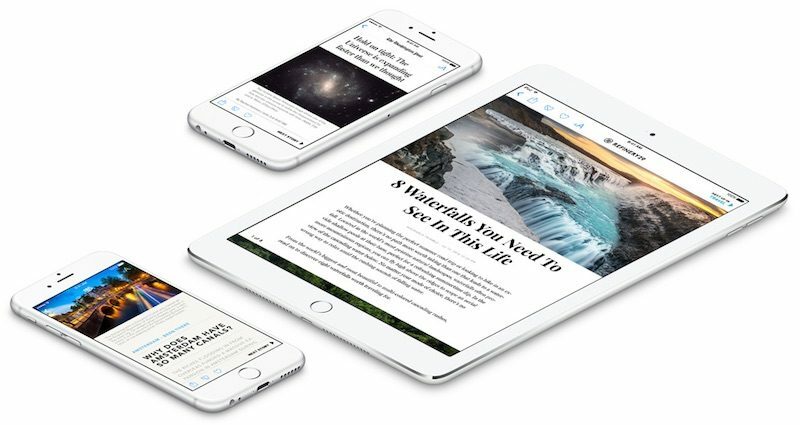 Apple News attracts millions of monthly readers on iPhone and iPad, but some publishers have been reluctant to adopt the platform due to limited revenue and hassles placing ads alongside content. Fortunately for publishers, that could soon change. Ad Age reports that Apple eventually plans to allow publishers to use the ad tech they already employ on their sites, such as Google's DoubleClick for Publishers, to deliver third-party ads in the Apple News app. The report, citing multiple unnamed publishers, claims Apple also plans to enable micropayment options so people can access articles "for cents at a time," but no specific details were provided. The changes, which reportedly remain at least a few months away from being implemented, could lead to increased revenue for publishers, who in turn may find participating in Apple News to be more worthwhile. "The bigger thing is they've now seen the light," said the top publishing exec, who was familiar with the plans but spoke on condition of anonymity. "Apple is acknowledging it can't force its ad technology into the marketplace and it makes more sense to allow standard ad serving." Apple recently updated its Advertising Guide for Apple News to indicate that third-party ad tags can be used to serve third-party Standard, Double, Large, MREC, Interstitial, IAB 300x250, and IAB 728x90 ads on iOS 10.3 and above. I've deleted Apple news a while back. "But fortunately that could change soon"
Not fortunately to any of us who use the service. I dislike ads as much as anyone but understand that content creators need to get paid. Advertising seems to be the only viable revenue stream since the general public seems to have an aversion to paying for anything internet related. All advertising isn't bad, but the over the top, in your face, auto-playing, cannot avoid advertising drags all advertising down in the public eye. If Apple can curate the advertising to avoid the negative kinds, I think people would be more accepting. Not an Apple news fans... but I think there's a little too much advertising since iAd1 - some sites are ruined by videos, full screen ads, fake close boxes that open up new windows, etc, etc... Web browsing on an iPad was once a joy, now it really stinks. can't wait for iAd2 to force me back to a laptop. Its not the ad's themselves but the ad with the dog that I seem to click when scrolling. Somehow make it where I see the ad but less sensitive to the click so I can move down the page without opening the ad all the time. I have to focus where to touch so I miss that thing. I'm okay with simple ads. I get it; someone has to pay for the underlying "free" service. But the things you mention are exceedingly annoying bullsh*t, and don't end up enticing me to spend money with the original advertiser-- which is supposedly the point. I'm at a complete loss to why Apple would provide this app for their iOS platform, much like Health, Podcasts, iTunes U. Who uses these apps? They should provide apps only everyone would use. A news aggregator like Google News/Drudge Report but with an Apple UI design isn't what a computer needs. It isn't something that helps to define the iOS platform experience and expectations. News app? Seriously? As if people would say this: "Hmm, let me check the weather. Oh, it's sunny all day. Okay, now let me check the news on the News app." I use the iOS News app every day. Outside of Safari and Mail, it's my most used app on my iPhone and iPad. It's flexible and works extremely well. But then, I'm into news. As are many other people. Well said! I will concur that there should be some mechanism to reward publishers for the content. Even advertising is not inherently bad. My personal gripe is when you get 3-4 sentences of content buried in a full page of ads. Here's a couple of options that I could be happy with. 1. A subscription to "Apple News" that would take care of MOST finances in the background. What would be an appropriate cost? I'm thinking the price of a daily newspaper plus a magazine. Maybe $10/month? My local paper (the Fort Worth Star Telegram) sells digital only subscriptions for $99/year. I would cheerfully pay that for a fully advertiser-free experience. 2. Up-Front Advertisement: read/watch an ad or 2... then get access for a short time. 3. In-line Advertisement: limited to 1 or 2 ads per page and no more than X (20%?) of the screen space. No thanks, I'll stick to Safari AND ad blocking add on's, until Apple ban them from the App Store. What is the point of Apple News? To try and steer people away from Facebook? I follow the news but I can’t repmember the last time I launched this app. Seems pointless when I can get this stuff elsewhere. I use it as a place to read the likes of MacRumors, 9to5Mac, MacStories, Outside, National Geographic rather than using Safari. I tried out Apple News, I just couldn't find anything I liked... all the articles written have a Marxist bias.